Treat have been one of my favourite bands, ever since picking up a copy of 'Dreamhunter' way back in 1987. At the time I rated them as good as Europe, and with their absolutely stunning comeback album 'Coup De Grace' in 2010, I would say they are now head and shoulders above their fellow Swedes. It was a personal coup getting the band over to play Firefest 3 in 2006, a show that was filmed and included for free on the re-issue of 'Scratch And Bite' by Universal. 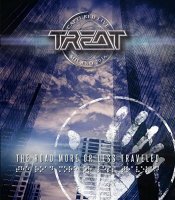 It was a mere forty-five minute long, but it served to demonstrate just what a tight and amazing band Treat are, and up till now was the only official Treat DVD available. Which bring us to 'The Road More Or Less Traveled' (and I do hope they change that horrendous American spelling before release), filmed in 2016 at the third annual Frontiers Festival just outside Milan in Italy. At this time the band were supporting their latest album, 'Ghost Of Graceland', which while not reaching the same levels of brilliance as '...Grace' in my opinion, still contained a multitude of wonderful songs. So now the band had two recent albums to cherry-pick tracks from, as well as their extensive back catalogue, and all things considered they came up with a delightful set-list. Opening up with the triple combination of 'Ghost Of Graceland', 'Better The Devil You Know' and 'Nonstop Madness' from the new album, the band also included highlights from '...Grace' in the shape of 'Skies Of Mongolia', 'Roar', 'Paper Tiger' and 'We Own The Night' alongside classic fan favourites 'Get You On The Run', 'Conspiracy' and 'Ready For The Taking' before ending, as usual, in the massive crowd-participation sing-along that is 'World Of Promises'. So the set-list cannot be faulted. Unfortunately, just as with the Helloween DVD reviewed elsewhere this issue, the production company brought in to do the filming simply are not masters of their trade. Once again there are no spotlights out front, meaning the stage is in darkness most of the time. The shots are mainly perfunctory with the editing simple and not exciting. So in the final analysis, the DVD is amazing to listen to, but so incredibly disappointing to watch. This is supposedly the first of several live DVD releases from Frontiers Fest, but if the others suffer from the same lack of visual quality, then this is an opportunity well and truly missed and must be fixed for future events.